Israel by Bike is our on-the-saddle, outdoors journey through the storied Land of Milk and Honey. If you're the kind of person who loves to explore new places on two wheels, we invite you to hike, bike, raft, float, and swim your way across this ancient land! You'll experience some of the most adventurous outdoor opportunities Israel has to offer -- all packed into a 10-day journey. More than just an outdoors adventure, on Israel by Bike you'll discover 3,000 years of Jewish history, form new cross-cultural friendships with Israeli and North American peers, and you'll experience all the must-see/must-do highlights that you expect! Each itinerary is unique according to your exact dates, the time of year and so many other factors. Browse the sample itinerary below for a taste of the journey that awaits you. 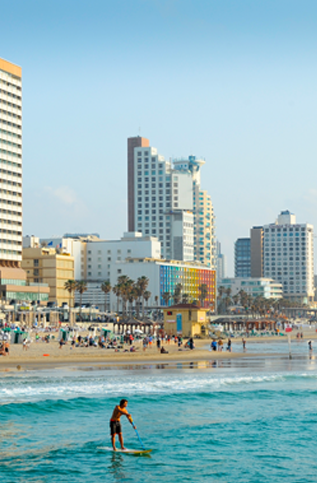 Israel by Bike is a more active experience designed for anyone who’s physically fit and is comfortable on a bike. The itinerary includes about 5 hours of off-road biking, plus a night camping under the stars. Bikes, helmets and all necessary gear will be provided at no cost. Begin the day with the Nahal Amud canyon hike in the Galilee mountains then enjoy a bike ride along the Jordan River. Ascend the beautiful Golan Heights for a spectacular view of the region from Mt. Bental. Follow that with a fantastic tour (and tasting!) at the Golan Heights Winery. Today begins with a somber visit to the Yad Vashem Holocaust Memorial and Museum, then continue on to Mt. Herzl – Israel’s National Cemetery. After time of reflection, you’ll descend from the heights of Jerusalem into the desert and settle in at tonight’s campsite. In the evening, you’ll spend time engaging in a mifgash (cross-cultural) discussion with the Israeli peers who join the journey. Hang out around a group bonfire and then sleep under a million stars in the heart of the Judean Desert. Wake up long before the sun comes up for your pre-sunrise ascent to Masada via the storied Snake Path Trail (it’s worth the early hours). Explore the desert mountaintop fortress, and then cool off swimming under the desert waterfalls at the Ein Gedi oasis reserve. Start with a bike ride through the desert, and then visit the desert community of Sde Boker to learn about David Ben Gurion, Israel’s first prime minister, and his vision for a blossoming desert.